So this is a three-page bit from Issue 11 of the mainline IDW comics. It's probably the first time Ogres and Oubliettes was established to exist in the MLP universe, so it makes interesting fodder here. So how exactly are you doing? Are the players role playing playing the game or something? 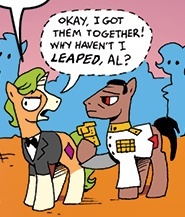 This is just one of those times where I use a shot of ponies to portray out-of-character actions. It comes up more than you think in this comic. Screenshots of AJ and Rarity from Look Before You Sleep intercut with the action from Dragonshy come to mind. Speaking of Look Before You Sleep, there was a guest comic page (I think) that used that episode for screencaps of OOC actions. "It's not a slumber party! Don't call it that!" Guest comic nothing. It happened in canon, more than once. As to the sleepover, you may be thinking of one of my guest comic arcs. It looks like a d8, yeah. alternative interpretation--he's good at probability, which means he's good at playing/running these games because the dice give him the results he wants. I henceforth unofficially declare his name to be Game Master! I have no idea what his official name is, but I stand by it! We're not supposed to know anyone already besides Shining Armor, are we? They're his old high school friends. The comic this page is from takes place almost entirely during a flashback to Shiney's and Cadance's high school days. Fun fact: From left to right in panel 1, the other ponies at the table are named in the comic as Poindexter, Gaffer, and 8-bit. Even funner fact: one of those ponies is actually a character from a completely different show but nobody knows it. I did an outright spit-take when I saw that in the background. Overall, this arc is one of my favorites of the comics (even if it does rely on a narrow band of nostalgia). 8-bit's got a Space Invader cutie mark! I hate this site so kuch it keeps me from getting credit for all my best comments! I'm the guest who posted the "even funner fact"
If the GM suddenly stops in the middle of the module, looks around, facehoofs and mutters, "Oh boy..." that will be the icing on the cake! 8-bit? So if ponies have video games, does that mean that there is a pony version of Doom somewhere? Oooooooooh. Are we going to learn more about Twilight and the issues she has with her brother? Excellent! I love learning more about the players and their relationships in comics like these! So, where is this going? Full Frontal Neighdity? Knights of the Whinny Table? Dork Pasture?